In the 2004 Mr. Olympia Finals Pump Room you will see all 19 competitors as they pump, pose and await the results on stage. Includes sensational footage of RONNIE COLEMAN posing with victory medal #7. You get the very best footage from both our cameras as we mix the action with the drama of this world’s greatest bodybuilding show. In the 2004 Mr. Olympia Finals Pump Room you will see all 19 competitors as they pump, pose and await the results on stage. This was the last Olympia held at the Mandalay Bay Hotel. 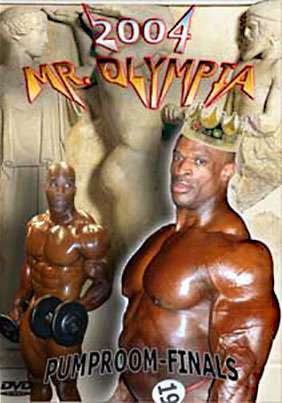 Includes sensational footage of RONNIE COLEMAN posing with victory medal #7. You get the very best footage from both our cameras as we mix the action with the drama of this world’s greatest bodybuilding show. See some of the greatest ever pump room footage of Ronnie. This was our last great Mr Olympia Pump Room for several years. We were back again in 2009 at the Orleans Arena!! MR. OLYMPIA COMPETITORS AT THE PRESS CONFERENCE WITH IMPROMPTU POSEDOWN. A SUPERB FINALS PHOTO GALLERY.